I’m not always the best at telling you how I feel, but I wanted to try and express how much I appreciate everything you have done for me over the years, even when I made it incredibly difficult. I am so proud to be your son. It’s safe to say I had a difficult childhood, as several of the posts here have detailed. I hated having to go to school, dreaded the experiences I knew I would have there, but home was always an escape. You didn’t know what I was going through, through absolutely no fault of your own, but still you made sure I had a safe space at home, a place where I felt loved and supported and valued. Not having the courage to tell you about what was going on at school is one of my biggest regrets - I know now how amazing you would have been. However, instead you were faced with an emotional, confused and distressed child, who often gave you hell as a way of dealing with the trauma of being bullied at school. In spite of not understanding the cause of my anger, my mood swings, you never stopped doing everything you could to support me. I was encouraged to pursue any hobby, sport or interest I wanted, from football to trumpet and finally landing on basketball. I was given opportunities to talk and share and develop as a person, and although I didn’t always take you up on these opportunities, it meant more than you can know to know they were there. I’m so sorry for every time I pushed our family to its limits. I viewed myself so badly, but you always believed in me. I could not be more grateful. You had endless patience, putting me back to bed every night when I chose to sleep on the landing (although not without photographing the moment, of course!). You stood in the rain on Sundays watching me attempt to play football (I was terrible) and volunteering to bring hot drinks for the other equally chilly parents. You took me to band practice, setting up a tuck shop for everyone and getting involved. You worked extra hours to support me going to America to play basketball, and spent every weekend driving me all over the country to sit in freezing basketball courts and cheer me on. The level of sacrifice you have made for me is incredible, but you have never resented it, not even in the most difficult times - like when you had to referee arguments in the DVD rental store each month. You gave us the very best childhood possible, and did it with such generosity. I look back with such warmth at our bacon and egg breakfasts at damp campsites all over the country. I know now that at times you were also going through struggles, but you never let your children feel the effects. To say you are an inspiration really does not do you justice. It was a few years later that you were really tested. You dropped me off at the University of Chichester, where I was supposed to be beginning an independent life as an adult. I lasted a week before things began to go sideways. I had my first psychotic break, and suddenly, on top of everything else, you had to deal with a son who heard voices that weren’t there, who believed the world was out to get me, and all the other fun stuff that comes with my illness. You have seen me at my absolute lowest point. Acutely paranoid and psychotic, suicidal, being carted off in secure transport. What makes this worse is that when I am in the midst of my delusions, you are an agent at the centre of the conspiracy I became convinced was real - I can’t imagine how much more difficult this must make it for you to support me. But you never wavered. You were always there, driving for hours to visit me in hospitals miles away, waiting in so-called family rooms to see me, telling me things would be okay. Your unshakeable support and love for me in the times of worst despair has always helped me to see the light at the end of the tunnel. Knowing I had you on my side has given me the confidence to face my mental illness, and I wouldn’t be where I am today without it. There were so many times when I completely wrote myself off. I was convinced that, no matter how much effort I put in, I would never be able to lead a fulfilled life. I felt so alienated from normality. I loathed myself, but you challenged my perception. Where I doubted, you believed - and look at me now! I’m in a full-time job that I absolutely love, full of hope for the future. I can honestly say I am in one of the happiest and most stable places I have ever been, and so much of that is down to you. You have always been in my corner, taking as much of the load for me as you could, putting my needs far above your own. Sitting for hours upon hours cutting out shapes of Cornish pasties (thank you, Food Tech!) or revising cell division. Peaks and troughs are inevitable with my illness, but no matter where I am or what I am doing, I can always depend on you. Thanks to you, I can look at myself with pride. I hope I can make you proud too, because you deserve to be proud - proud of bringing two children into the world, and giving us everything we could ever need to accomplish anything we wanted. 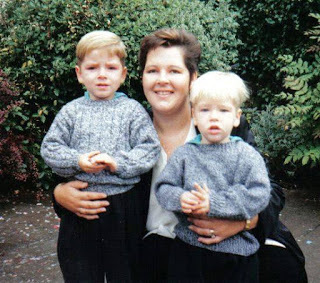 You are the best mum in the world, and I’m willing to fight anyone who disagrees! I love you so much. Thank you, simply, for being you. You are awesome, and I am proud to call you my mum. Today is Mother’s Day, and I know mothers across the country will be getting flowers and chocolates and cards. You’ll be getting this letter and a croquet set, because we’re weird like that. But I do hope that anyone who went through what I went through takes a minute today to think about the people who were unquestioningly there for us every step of the way. The people who never asked to be thanked, never looked for recognition. The people who took every hurtful thing we threw at them and continued to be there anyway. For me, one of those people is my mum, and I’ll be grateful every day for everything she’s given me.